Six people, including three members of a family, have died in River Ankonim at Adagya in the Bosomtwe District of the Ashanti Region after flashfloods from a heavy downpour swept away their Hyundai Avante saloon car on Thursday night. The victims are George Wireko, 65; Mercy Wireko (his wife), 45; Okyere Wireko (son), 15; Akwasi Baah, 15; Christopher Asare, 38, a carpenter and one Justice. They died instantly after the car on which they were travelling was carried away by the flashfloods into the river around 7:40 pm. Father-in-law to Christopher Asare, Yaw Tawiah, said all the victims are Jehovah’s Witnesses. The tragedy occurred when they were returning home after participating in a construction project for the church at Adagya New Site. 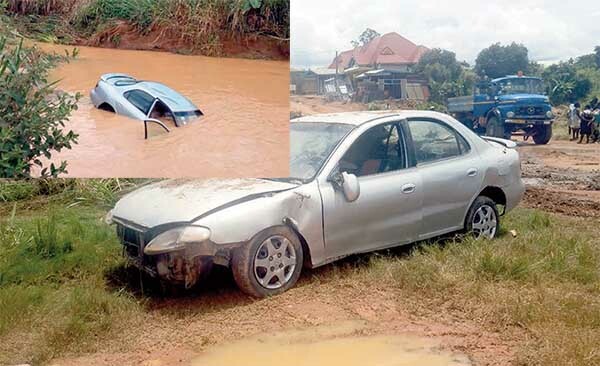 He told DAILY GUIDE that in an attempt to cross the river on the dilapidated bridge, Mr. Wireko’s car, which was following a 207 Bus, was swept away by the flashfloods into the river that had overflown its banks. “Several attempts were made to rescue the victims, but the magnitude of the floodwaters frightened us and the fire officers. We, therefore, retreated momentarily until the floods receded before we resumed the rescue mission,” he narrated with tears. According to him, the deceased driver was initially signalled to stop by another driver, who was coming from the opposition direction, but he did not notice the warning signal. He disclosed that the bodies of five of the victims were recovered by divers from the community after close to eight hours of search, while that of the sixth person was later recovered early yesterday after libation had been poured. The bodies had since been deposited at the St. Michael Hospital Morgue at Pramso, while police conduct investigations into the incident, Mr. Tawiah added. The District Chief Executive (DCE) of the area, Joseph Kwasi Asuming, who rushed to the accident scene with the Ashanti Regional Coordinator of the National Disaster Management Organization (NADMO), Kwabena Senkyire, confirmed the incident. They were accompanied by the Ashanti Regional Deputy Minister, Elizabeth Agyemang, and the Member of Parliament (MP) for Bosomtwe, Yaw Osei Adutwum and other security officers. According to residents, the Ankonim River always overflows its banks anytime it rains, thereby causing part of the bridge to break into two. As at the time of leaving the community, the river was being dredged with an excavator from Zoomlion Company.